Torn between the decision to stay in a stable job as a train station ticket collector, or to pursue his dream of being a successful cricket player, M.S. 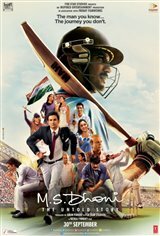 Dhoni (Sushant Singh Rajput) has to make a difficult decision that will decide the fate of the rest of his life. Based on the life of Indian cricketer and current captain of the Indian national cricket team, Mahendra Singh Dhoni.